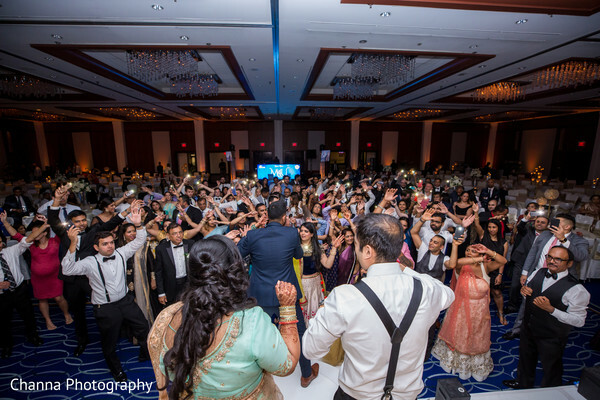 After the dreamy nuptials ended and Jaimy & Chirag vowed to love each other for the rest of their lives, it was time to honor that commitment with a grand party only Maharanis are able to pull off. 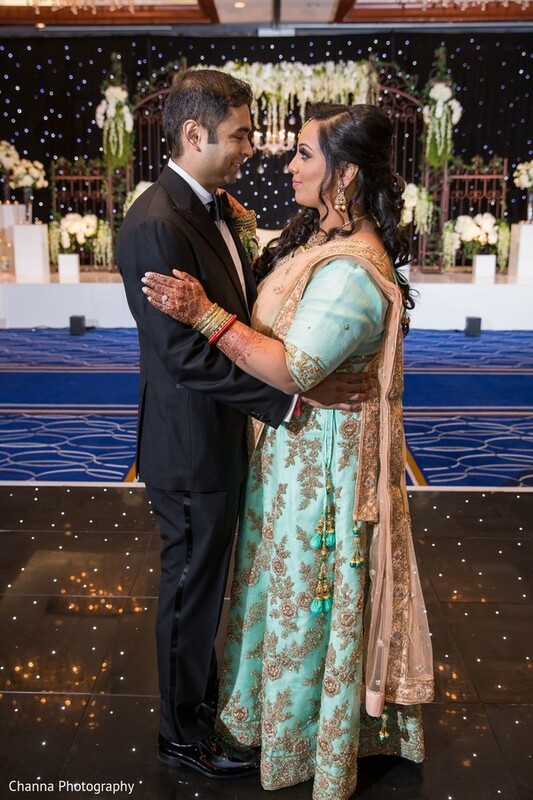 The reception hall of the Hyatt Regency New Brunswick welcomed the newlyweds and their loved ones for the party, and as you can expect, it was absolutely glamorous! 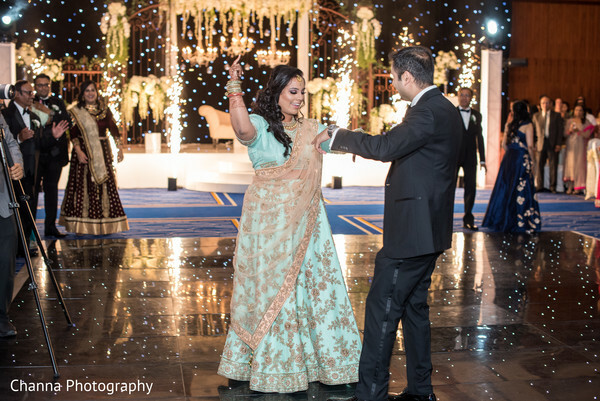 The team from Wedding Design by Ravi Verma created the enchanting floral designs and decorations that embellished every single corner of the venue, and it was as magical as the night the couple met. 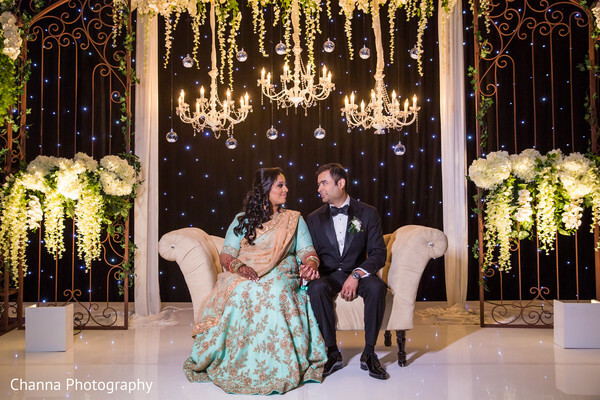 Everything was set up to match the bride's amazing teal and coral lengha, and also, their love for a starry night. That same star that with its light, shone in their hearts, the love for each other. Truly an outer space kind of connection! Chowpatty Catering and M4U Events completed the reception squad delivering the tasty treats and ravishing beats that for sure, left everyone stocked, mesmerized and touched by the stardust that fell over the spree. So, join us one more time in the full gallery by Channa Photography! In 2015- we met online. Being both doctors, time was not always on our side and I had minimal chance of meeting people since I had moved from the U.K to the U.S.A.Our first date was at a local restaurant in New Jersey. The plan was to go to a happy hour maybe for an hour or two and see where it took us. Unknowingly to both of us we hit it off and ended up staying for dinner and till the restaurant closed which was 6 hours later! After numerous meetings, it was one night in NYC at our friends birthday that we realized we had fallen for each other. Cliches as it sounds, it was a clear night with stars sparkling away (this actually became our theme at our wedding! A night under the starry sky”. Chirag had to make a decision on wherever he was going to stay in New Jersey or move to Chicago for his cardiology fellowship. According to him he knew quite early on and decided to give us a go and hence stayed back in New Jersey. A year after, I had to move to Boston to work at the hospital there. It’s true what they say that distance makes the heart grow fonder. After our busy schedules somehow we managed to always drive to each other to meet. At first, it was hard to go from seeing each other every day to only being able to see each other once a month. I think this time apart tested wherever we truly were meant to be together. If anything it most certainly strengthened our bond and as I came to the end of my training as a doctor, he decided to propose! Surprisingly I had no idea he was going to propose. I remember coming to New Jersey to spend a week with my family around Christmas time and spend some time with Chirag. At that time, I was interviewing for internal medicine residency positions in New Jersey. That week I had an interview as well as spending some quality time with my family. However, I was so tired given that the week before I had been working almost 8o to 90 hours. It was one of the coldest days of the year and Chirag had organized some time to spend in NYC together. There may have been subtle clues such as wanting to go ice skating in Central Park all of a sudden and my sister in law asking me a day before to get my nails done (something we don’t regularly do) small clues were missed by me simply because I was tired and was worried about my interviews for a job in New Jersey. I remember walking around in Central Park, again I must highlight the fact that it was the coldest day of the year. The sun was ready to set and Chirag asked me to climb up on a rock with him so we could take a selfie with a Central Park view (again just want to highlight that in our relationship it’s always me that wants to take selfies, not Chirag, again I didn’t think much of it) We had taken a picture and I turned around to look at my phone to see the picture as I turned back Chirag was down on one knee. Both of us were choked up that I can’t remember what he had said except ...” will you marry me”. Looking back as cliched as it sounds he wanted to place a “rock” on my finger on top of a rock that day. Later that evening our cousins and family got together in NYC. It was a simple yet unexpected proposal and it most certainly caught me by surprise! Our planning took approximately 10 months or so. The initial hardest part was venue simply because we both come from large families as well as friends and were hoping to find places greater than 500 capacity. I had heard of Maharani and the knot and took inspiration from there to look around. Also, a lot of Chirag’s friends had got married so they had also given some suggestions too. Although we both wanted a destination wedding we chose New Jersey at the end of the day mainly because my grandmother was quite sick and always wanted to see our wedding, as well as wanting our close friends who have busy schedules to help us celebrate our big day. We first shortlisted venues. It can take some time to find a venue and you can even sometimes lose time by going to see too many venues. I suggest doing a lot of internet research and phone calls to the venues so that you can get a shortlist of the top 5 venues. My main questions were: could this accommodate 500-600 people easily? Although this sounds small detail to me it was important to have a reception room with no pillars in the middle of the hall as it would obscure the view of our guests! Additionally, a lot of hotel venues now have certain vendors to which they have their contracts combined with the caterer or decorator which can make the bride feel restricted. I opted for a place that would have a city vibe, a hotel so that our guests who came from afar did not need to worry about traveling in between venues as well as a large space that had no pillars in the way of the main hall. Luckily I found Hyatt Regency in New Brunswick, NJ able to successfully tick all these boxes. They were very well known for having large events every weekend and reassuringly they gave us the flexibility to bring any caterer we wanted. Once the venue was booked I worked on the decorator, which can surprisingly get booked up quickly in New Jersey. I had several cousins recommend Wedding Design, Ravi Verma. I had shopped around for few other decorators but Ravi has won me over with his creative mind and utmost professionalism as well as being reliable. Our DJ my husband had selected, being born and raised in New Jersey he had several options for his entertainment but in the end, M4U had won us over. We had also gone to Dulhan to his expo which helped confirm that this was the DJ we wanted! Makeup and hair I tried to secure 6 months before my event. It was worth it! 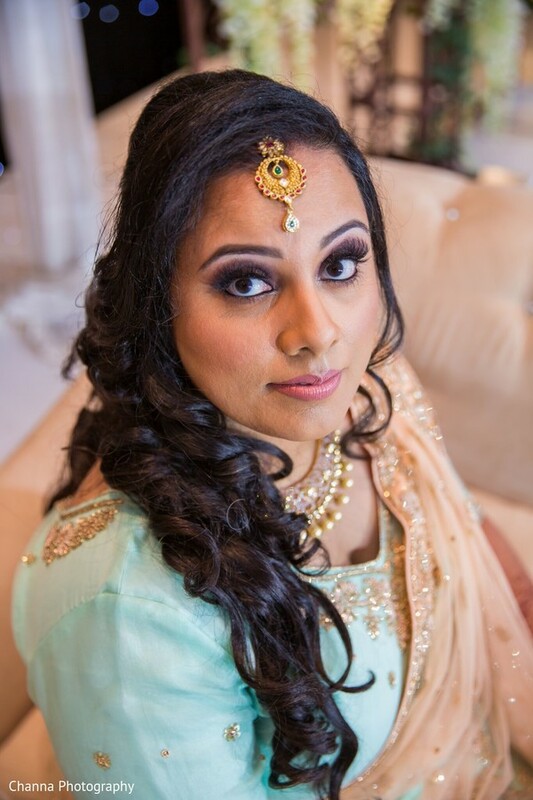 I had the pleasure of having Bhargavi Patel, the CEO of Cinderella Bridez do my wedding and reception makeup. When I first met her I felt at ease, it anything despite her success she remained humble and treated me like a family member. She had recommended me to a personal trainer and had stated that a good skin regimen and gym regimen would help me glow more on the day of the wedding as opposed to just applying makeup. She was great to work with and it was a great package to have someone mentor you on skincare pre-wedding as well as a fitness regimen! Our outfits were purchased from India, 8 months in advance. I loved Sabyasachi designs of wedding and reception lenghas and opted for those designs on my special day. Food and dessert were secured 8 weeks before the wedding. I strongly suggest maintaining frequent contact with your caterers and having them involved/introduced to your hotel coordinator early on. We hadn’t had a good experience with one catering company - it was after the recommendation of my work colleague in the hospital had suggested to reach out to Bukhara Grill in NYC instead. I recall eating their often when I used to visit in my school days and I loved it. Raja Jhanjee did a phenomenal job with our reception dinner and cocktail hour. He was innovative and able to keep some tradition into our food simultaneously adding a modern twist. Our lunch was typical Gujarati cuisine and so for this Chowpatty was our number one choice. I don’t live too far from their restaurant and frequently loved their food. Our guests really enjoyed both lunch and dinner that day. However, I think our dessert bar stole the show. Rather than having a cake cutting which we often see frequently in a lot of weddings and can sometimes go to waste as not everyone eats cake both Chirag and I decided on a dessert bar, I guess our thought was to appeal more to the kids but I know the adults ended up bringing their inner child out with the variety on display. I had the wonderful Dessert Ladies from Stirling, NJ design our dessert bar. Their tasting had won me over and their novel way of displaying desserts as well as different types of desserts such as the “bien trees” to “cake push pops” kept everyone entertained. My brother had introduced me to them and I was happy I chose them. Lindsay was very imaginative. I loved her vision! 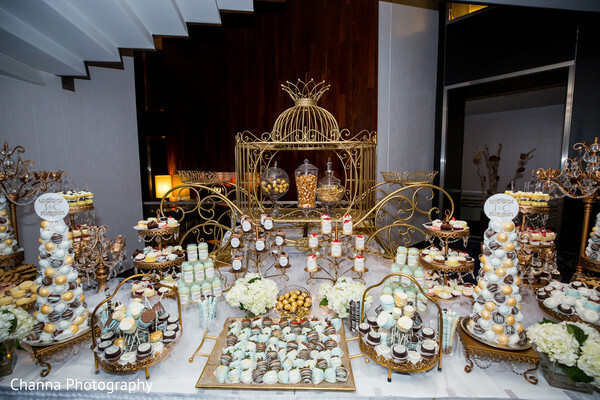 I never knew that we could create a dessert bar and have the fondant/ icing of desserts match my reception outfit. It was a mint green gold dress and they did an excellent job to match it! They wanted to know my theme and I had explained that we were going towards a “night under the stars theme”. From there they were able to provide a display that mimicked an English garden theme at night with fairy lights being displayed. This was intended to match our theme of the starry night. 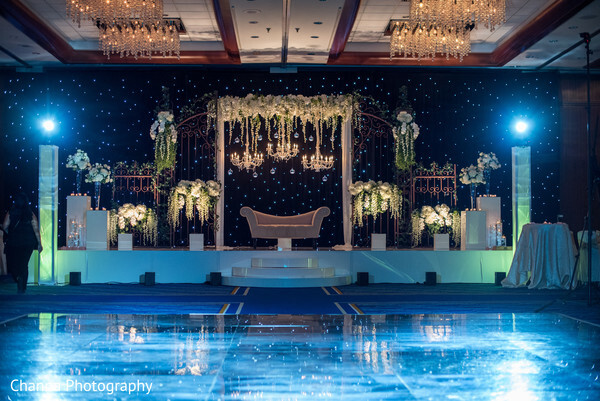 With this theme, we were able to get a starry backdrop for our stage for the reception. The garden gate was added with fresh flowers and candles intertwined to mimic an under the stars theme in a romantic garden. Again the centerpieces were gold to match the gold embroidery of my dress and also match the love gold carriage that was used to display our desserts. Chirag and I wanted to extend our theme even further for our starry night. So we created signs and even a “when we met” stars sign. All the backdrops of our sign had a starry background to match our reception decor. Additionally, we created table name cards with a starry backdrop. Small details such as table numbers we opted for in gold on backdrop of sparkling dark blue in order to match our theme. 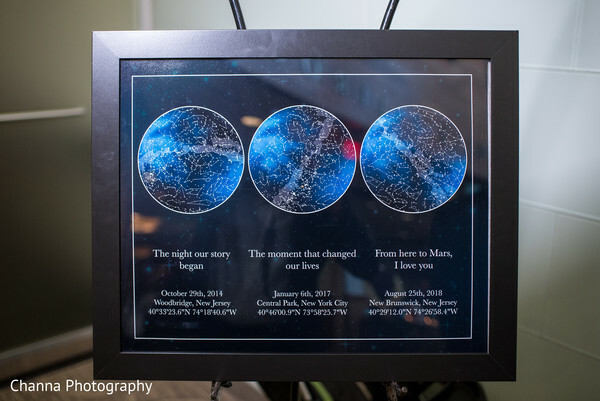 Our wedding favors were glass coasters with a starry backdrop on them. According to our family members it was clear we had a theme going on and several had mentioned that they had not seen this level of small details running through a constant theme. Chirag and I wanted to say thanks to our guests for coming from afar and staying at the hotel so we had welcome bags which had a starry themed wedding insert outlining the events, with several snacks and water bottles for our guests. If your hotel gives you it then go ahead and do your signature drink. Corny as it sounds but as it was two doctors Getting married we decided to have a drink called “a painkiller” just what the Dr ordered! As much as we spent time on all the details and vendors despite both of us having very busy schedules as doctors in training we wanted everyone just to have a good time! Therefore music, food, DJ and the liquor choice was something we wanted to get right. I believe going with an open mind helps when choosing outfits. What may look good on certain skin tones or body size may not be as flattering for someone else. We chose India for our wedding shopping which can be a double-edged sword as there is so much variety which can sometimes either end up becoming time-consuming or even more fun for looking for different choices. I’d probably have the blouse unstitched especially if trying to lose active weight. I wanted something more traditional with a combination of a slightly modern twist so I opted for maroon gold and blush pink. For my reception outfit, to be honest, this was not my original choice. It was perhaps my third choice after trying a few the reason I chose the outfit was because of my father. My dad is a stoic gentleman that doesn’t normally comment on what Indian outfits I’ll wear however when he came to the store he opted for the mint green and gold outfit saying it’d appear different. He was right! I hadn’t seen the color combination at any of the weddings I had attended prior to mine and noticed that this year mint green had made a comeback. I am close to my father and the fact that he opened up that day especially for someone that stays quiet! Was a big moment for me. The enjoyable part is actually the end part. It seems more enjoyable towards the end when you finally start to see all your ideas and vision come together, we won’t lie but the food and dessert tastings were always a hit! The guests enjoyed the food a lot. Especially the variety of different cuisines offered at cocktail hour from a bruschetta bar to a tandoori meat grill station. I wanted to have a little bit of everything to cater to all types of palates. However, the dessert bar was a hit. The display and variety blew everyone away. Variety was the key here and we wanted to offer different desserts rather than a wedding cake only. The idea worked! We also had our caterer provide small to go boxes for any little treats. Essentially there was surprisingly no leftovers at the dessert bar! 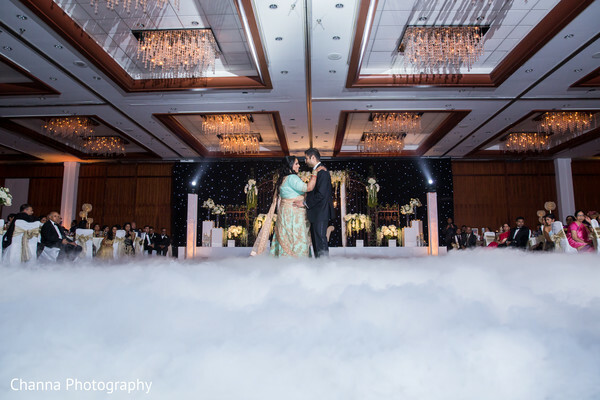 Our wedding guests also loved the music, the indoor sparklers, and the cloud effect to mimic dancing on the stars with the starry dance floor was a huge hit. A lot were impressed by our same day edit too thanks to the Channa Brothers for capturing the pre-wedding and the day off so well! The moment those lyrics played and I saw the expression and tears in my parents' eyes will always be a moment I’ll never forget. Finally, my brother's speech struck an emotional chord too. A stoic protective older brother and I didn’t see him get emotional that day but his speech stood out to me to which he said “just because I don’t cry or express my emotions throughout today doesn’t mean I don’t care" "Words cannot express how proud I am of you and how happy you’ve made me and our family”. Earliest things to get booked are venue decor and surprisingly makeup artist! Djs and food can be the next tier. Keep a spreadsheet of your list of vendors and finances tips etc. you may have given. Also, have all contact details email addresses for each one! - Try to get a wedding coordinator to help you on the day of to ensure things run smoothly if you are unable to afford a wedding planner. - Have a few key reliable family members or friends that are not part of the immediate wedding family have an active role. In this case, I had my auntie and her cell phone given to various vendors just in case things were not working out or one of my other cousins to deal with other issues or getting family together. - Family pics on Mandap! Be efficient, allocated groups with family name and numbers and let your MC call out each group at a time. This will just stop unnecessary crowding on the stage! - Brides keep your jewelry Bangles shoes matched early in advance - don’t wait for the day of or a few days before. Just in case if something goes missing or misplaced take pics on your cellphone of all your outfits with matched jewelry and shoes or Polaroid pics and hand to your maid of honor or bridesmaids. Smile, smile, and smile! Even if you realize there maybe small mess ups this level of detail only you’ll know about and not your guests so best is to not sweat about the small things, enjoy your day and smile as you won’t realize how many candid pics and shots your photographer will be taking. Just enjoy the day- you’ll be so surprised how months of stress and running around for 12 months will just all be over and done within the space of several hours in your events. So enjoy each moment. Enjoy the time with your family and friends as it’ll be a long time until you’re able to get everyone you love all in one place at the same time! Remember, a brand new wedding everyday! 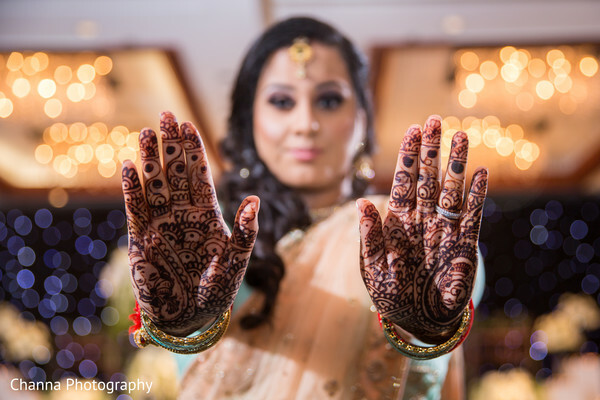 Channa Photography, M4U Events and Chowpatty Catering are members of the Platinum Guide. Love what you see? Explore their portfolios.